The grape (vitis spp.) is a true berry that grows on a woody, perennial, deciduous vine. The vines produce tiny green clusters of flowers in early spring just before fruit production. Grapes grow on the previous year's vines. Pruning reduces the number of grapes that will grow on the vine. If you do not prune, the plant will produce too many grapes and damage the vines. Prune grape vines in late fall after the leaves have fallen and they go dormant for winter. This is also when the limbs begin to harden. Remove all of the previous year's growth. Use sharp pruning sheers to cut the older shoots all the way down to the main trunk. Make your cuts at an angle so there will be no standing water on the cut stems. The wood will be larger than the size of a pencil and gray in color. New growth is the size of a pencil and reddish brown in color. Choose three or four well-spaced shoots and trim them down so that there are 8 to 10 buds left on each shoot. Trim the vines harshly. Remove almost 90 percent of all growth. Prune off all of the other shoots down to the trunk. This will leave approximately 35 to 40 buds per plant. Each bud will produce three to four bunches of grapes. 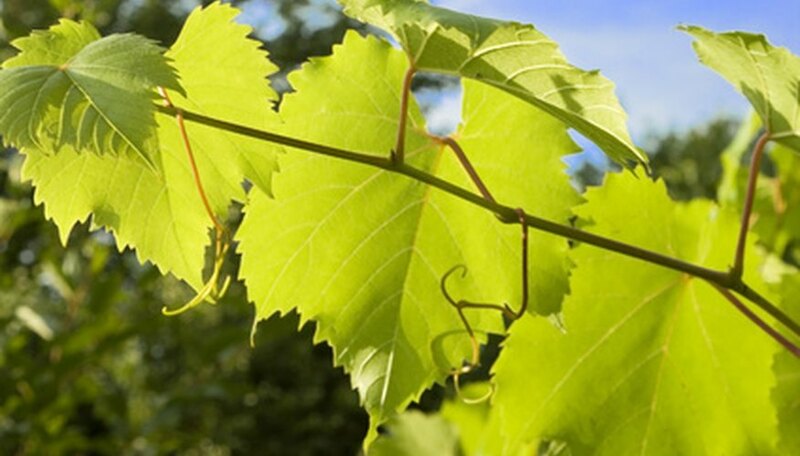 Tie the remaining grape vines to your trellis, arbor or other supporting structure. Dispose of all of the trimmed vines.